Rotator cuff is a group of four muscles around the shoulder joint, which help in rotatory movements of the shoulder. They also help keep the shoulder joint stable during movements. Impingement means to collide against something. In the context of rotator cuff, impingement refers to collision of the rotator cuff with acromion (part of scapula) and the head of the arm bone (humerus). Normally, the upper part of the rotator cuff gets trapped in the coraco-acromial arch, when the arm is fully lifted up. However, there is just enough space, for to and fro movement of the rotator cuff. Sometimes the arch is narrowed further, by bony overgrowth, or an abnormal acromion process. In this case, the rotator cuff frequently hits on the acromion and the head of the arm bone, causing damage to the rotator cuff tendon. This is also seen with mild shoulder instability, because of the abnormal movement of the bones upon each other. It is more frequent in people using their arm in overhead activities, like swimming, throwing, and so on. This syndrome frequently manifests with pain while lifting the arm upwards, which disappears when the arm is lifted upwards. The pain worsens with time, as more and more parts of the tendon are damaged due to repetitive overhead movements. 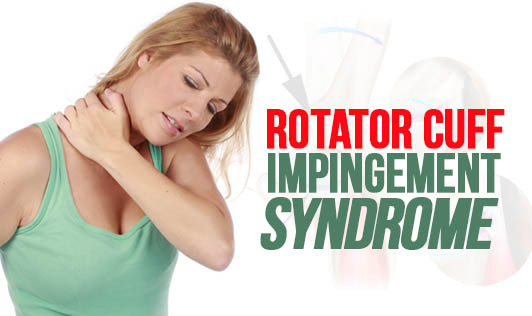 The treatment of impingement syndrome consists of taking a break from overhead activities, along with analgesics and anti-inflammatory medications. Strengthening of the damaged rotator cuff with physical therapy helps to reinforce the stabilizing function of the rotator cuff on the shoulder joint, which in turn decreases further damage.